Resdential Building Surveyors in Kent. Browse through our site to see how we can help you. A party wall is simply a wall that divides two parties and is shared by them. When buying a new home, many people rely on their lenders valuation, or the advice of a friend or local builder, to highlight any problems. A good value “building survey” visual inspection designed to provide you with a complete picture of the home you are about to buy. 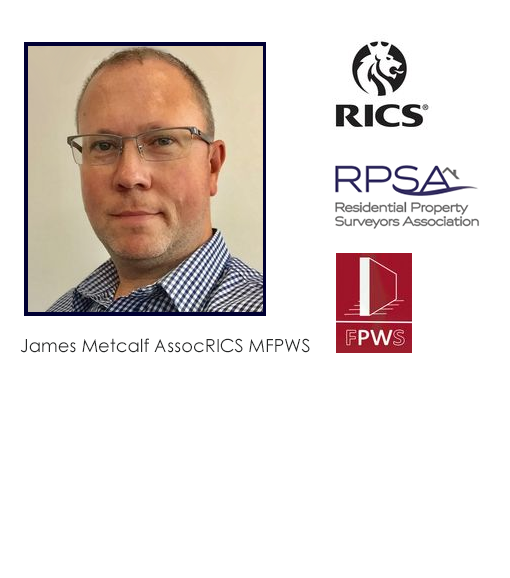 I am a qualified Residential Building Surveyor and Party Wall Surveyor based in Faversham, Kent and an Associate member of the RICS and a member of the Faculty of Party Wall Surveyors. I am very passionate about approaching surveying work in a professional manner. I am completely independent and pride myself on providing that all important friendly and personal touch. Whether you’re phoning or emailing, you will always be able to speak to me personally to get upfront clear advice. I have 19 years of residential property experience in the South East, so I am are well placed to offer sound & professional advice. "Excellent service, I could have not hoped for a better and quicker service than what we received. Everything was explained clearly, promises were kept and was able to sort our party wall notice in a short period of time, so we were able to start our building work on time. Most efficient & professional service ever. Thank you again!" "Worked with James on a loft extension project. James was extremely knowledgeable and helpful in explaining and running the party wall discussions on my behalf. Also I received extremely positive feedback from my neighbours on their interaction. Strongly recommend JDMs services for any prospective building work." "We called James of JDM Surveyors for party wall advice because were planning on creating a loft conversion at our home. We found James to be very knowlegable and spoke in a way that we could easily understand what our responsibilities were. He came to see us at our home to discuss our plans and to look around, so that he could be sure that the correct notices were served on our neighbours. Our neighbours didn’t consent to our notice and James was subsequently appointed as an agreed surveyor between us both. After a condition report was completed the party wall agreement was quickly produced to both our satisfaction and now works are planned to start in the near future. We wouldn’t hesitate to recommend James to anyone needing party wall advice."